Bodine Castle was located at 4316 Vernon Boulevard in Long Island City, New York. Originally constructed in the late 18th century, it achieved its castellated form in the 1860s during the ownership of one John Bodine. Bodine was an official of the Long Island City Savings Bank. It seems he also had political aspirations, as he lost the mayoral race in Long Island City in 1876. Bodine Castle was a true suburban villa of the sort popular during the 19th century. It was located on a generous plot of land, bordering on the East River, facing Manhattan Island. The main portion of the house was one and a half stories high. A large square tower, surmounted by a slender octagonal turret, was attached to one side. All was covered by a layer of large, rough blocks of stone. To the rear was a smaller wood frame wing, constructed in the 1890s in a similar style to the rest of the castle. Unfortunately time was not kind to Bodine Castle. The house stood empty for many years, its grounds having become the site of a lumberyard. It was demolished in 1966. I have sent with this email a picture taken from the Historic American Building Survey, from the Library of Congress website.The HABS website includes a total of 9 pictures of Bodine Castle. Additional pictures can be found in the book "American Castles" by Cavalier, published a number of years ago. I saw and read your article on Bodine Castle, right off of Vernon Blvd in Long Island City, New York. It is a great tragedy that it was demolished in 1966. I was born, raised, and lived in Long Island City for 40 years. It was, and still is, a great place to live. As soon as I get my 'act' together, I plan on returning there to live. As far as I recall, Bodine Castle was demolished as a direct result of Consolidated Edison's building of the 'Big Alice' power plant. The Castle was located on property that Consolidated Edison had acquired as a result of the 'Big Alice' power plant project. In those days, there was no Landmarks Preservation group to speak of so Consolidated Edison made no attempt to preserve this architectural heritage for posterity. 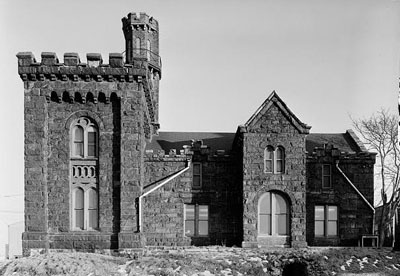 As late as 1961, there was an actual family of about 4 members living in Bodine Castle. One of the family members was a daughter named Arlene. She was, and probably still is, a great looking blond and I was fortunate enough to almost have a date with her. I think this particular family, whose last name escapes me, moved from the Castle as a direct result of the aforementioned 'Big Alice' power plant project. By the way, speaking of 'almost', I almost had the opportunity to visit her, Arlene, at her 'house', which of course was Bodine Castle. The story about Bodine Castle that those of us living in Long Island City, Hunters Point Section, heard was that the original builder was an actual titled Count whose last name was Bodine. Since he was a member of the French Aristocracy, he had fled France in approximately 1789 or 1790, soon after the French Revolution. The Count had several children, and based on the article read regarding Boding Castle, the family lived there for many generations. The New York City Landmarks preservation Commission considered making it a city landmark (just like Fonthill and other castles in NYC.) but it was declined in February 1966. Photo courtesy of Kevin Peterson.